The Republican from Angleton wasn't even a candidate a month ago. Now he says he has north of 100 votes — more than enough to win the gavel. On a Sunday night in October, a group of about 40 Republican members of the Texas House met in Austin to work out a problem: A year had passed since Speaker Joe Straus announced he was retiring — and while six candidates to replace him had emerged, none had surfaced as the clear frontrunner. Their goal was to change that, and many had their eyes on someone who wasn’t even in the race — or in the room that night. They wanted someone who would protect the independence of the 150-member lower chamber, even if that meant standing up to other state leaders. They wanted someone who aligned ideologically with a majority of Republicans, a concern some members had expressed with the current field of candidates. And they wanted someone who they thought had a viable path to victory — securing at least 76 of the 150 votes when the House voted on its next leader in January. The choice, at least for some members in the room, seemed clear: They wanted state Rep. Dennis Bonnen, a 46-year-old Angleton Republican who had spent almost half of his life in the House. 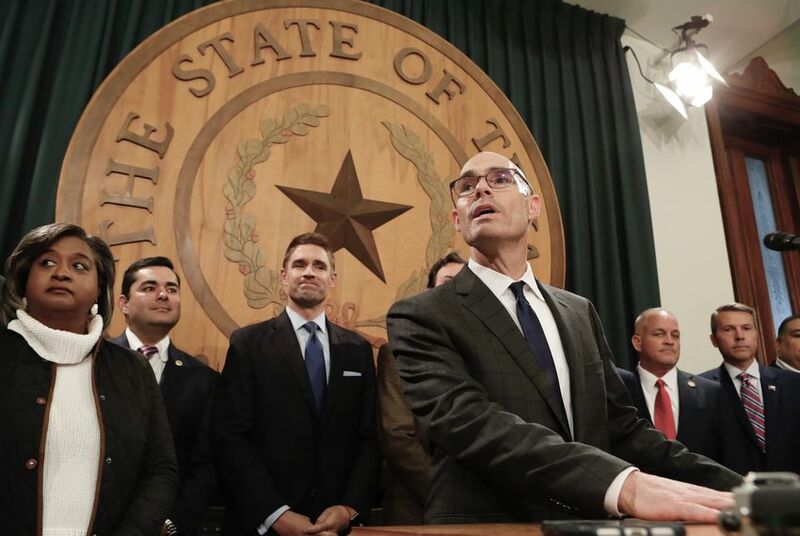 Bonnen, a shrewd tactician and top ally of Straus, had emerged over the past decade as one of the lower chamber's most outspoken members, going to bat for the House over high profile issues like property tax reform and border security. Getting him the gavel wouldn’t be easy. Just months before, Bonnen had waved off suggestions he’d run to replace Straus. And given Bonnen’s political leanings and reputation for combativeness, not everyone would be on board. But two days after the October meeting, Bonnen said he was in. The path was laid for him to be the next speaker. Prior to that meeting, Bonnen seemed almost repulsed with the idea of being speaker. In May, The Texas Tribune published a list of potential speaker candidates, one of whom was Bonnen. He quickly dumped cold water on the rumors, going so far as to joke that such talk upset his family. His Republican colleagues had other ideas. According to the House lawmakers who orchestrated the October meeting, Bonnen’s history of standing up for the House — coupled with his ability to unify both Republicans and Democrats — was top of mind when they decided to recruit him for the job. Ideologically, Bonnen sits close to the party’s right-most flank — a political science professor’s unofficial list ranks him as more conservative than half of Republicans in the 150-member chamber. That had the potential to make him more palatable to the chamber's more conservative members, who resented that the more moderate Straus was elected with the help of Democrats, and who were pushing for the next speaker to be selected solely by members of the GOP caucus. But Bonnen had also held leadership positions under Straus, who twice named him chair of the powerful budget-writing House Ways and Means Committee and three times appointed him House speaker pro tempore. Bonnen had also developed a reputation as tough-minded under Straus — someone who was willing to skirmish with the Republican leader of the upper chamber, Lt. Gov. Dan Patrick, who some House members believed attempted to push his agenda at the expense of the House. Bonnen said in 2015 that he viewed his role as “standing up for the House.” That year, he did so over a border security bill that he authored and that passed through the House with little opposition — then stalled in the Senate. “For some reason, Dan Patrick, the lieutenant governor, wants to bring the same bad Washington, always politically-gaming concepts to Austin instead of solving problems,” Bonnen said at the time. With Monday's development, some lawmakers predicted that more fights between the two chambers might be on the horizon. But both sides struck conciliatory tones. In a statement Monday evening, Patrick congratulated Bonnen and said he looked forward to “building a close partnership with him moving forward.” Bonnen said that he looked forward to working with the lieutenant governor, but also made clear he plans to stay in the role of top House cheerleader during next year’s legislative session. Even with many House Republicans who attended the October meeting backing his speaker bid, Bonnen’s entrance into the race wasn’t smooth sailing. Some attendees hoped to release a list of members who were behind Bonnen, but that list never publicly materialized. Meanwhile, House Democrats opted to keep their powder dry as their GOP colleagues continued plotting behind the scenes. Many said they believed it was too early to throw their support behind a single candidate with the makeup of the lower chamber still in flux ahead of the November election. Then, the minority party picked up 12 seats in the lower chamber — a feat that members from both parties said would considerably change the dynamic of the race. The day after Election Day, nearly 60 members of the soon-to-be 67-member House Democratic Caucus met in Austin to introduce new members and discuss the state of the speaker’s race. While some members insisted on taking their time before throwing their support behind a single candidate, others privately suggested the wiser move was to build on the momentum from the election and back their preferred candidate ahead of a House GOP caucus meeting scheduled for Dec. 1, when the 87-member group of Republican lawmakers was planning to coalesce behind its preferred speaker candidate. Despite differences among Democrats on how best to move forward, the caucus was making moves to appear unified. On Friday evening, the group’s chair, state Rep. Chris Turner of Grand Prairie, told members in an email that a majority of the caucus had already signed an agreement pledging to vote together for a speaker candidate. Only problem was, Democrats weren’t sure who to throw their support behind. For Bonnen, the race was just heating up. At the October meeting, state Rep. John Zerwas, a Richmond Republican who is more of a centrist, boosted Bonnen's candidacy by withdrawing from the race. But the real momentum for Bonnen picked up the weekend after the election, when the field of speaker candidates dwindled down to four, and eventually, one. On Saturday, Four Price, an Amarillo Republican, decided it was time to drop out and endorse Bonnen. Price’s departure, which became official the next day, knocked the number of candidates down to six. His exit — and his endorsement of Bonnen — set off a domino effect. State Rep. Phil King, R-Weatherford, said Sunday he was ending his candidacy and would support Bonnen. At that point, only one serious alternative was available. If members didn’t want to back Bonnen, they could hope for a deal between the two candidates left in the race, Republican state Reps. Drew Darby of San Angelo and Travis Clardy of Nacogdoches. Some House Democrats had privately said that a majority of their party would prefer to support Darby — another top Straus ally who was more aligned with the moderate wing of the GOP and who, according to two people familiar with the matter, was set to pick up an endorsement from Clardy. But as Clardy and Darby were finalizing their arrangement, state Rep. Tan Parker, R-Flower Mound, announced he, too, was dropping out. The outlook for Bonnen seemed almost certain; he called a news conference for 3 p.m. at the Texas Capitol. After that, state Rep. Eric Johnson, the lone Democrat in the race, dropped out and endorsed Bonnen. At the news conference, Bonnen announced he had support from 109 of the 150 House members for speaker, well above the 76-vote threshold. Soon after, Clardy and Darby ended their bids, and Bonnen released his list of supporters, which included lawmakers from across the ideological spectrum. 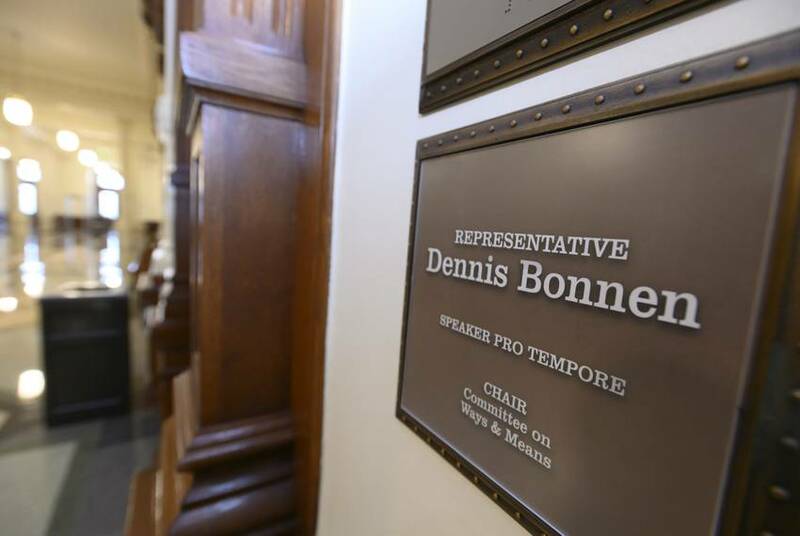 For many of the remaining holdouts, Bonnen's triple-digit support seemed insurmountable, even with weeks to go until the formal speaker's vote. By Monday night, even Darby — who just hours before was being positioned as the alternative to Bonnen — seemed to acknowledge that was true on stage at a Texas Tribune event. “I have already sent Bonnen a congratulatory message,” Darby said.